AT&T Communications CEO John Donovan won’t be smiling now — while T-Mobile and Verizon calling out AT&T’s “5GE” antics may have amused him, news of the federal lawsuit filed by Sprint against the company likely will not. In a strongly-worded complaint filed with the Southern District of New York, Sprint is looking to get AT&T to stop referring to its 4G LTE Advanced network by the misleading term 5G Evolution, or any other similar name with the words 5G in it. Sprint’s reasoning for the lawsuit is pretty straightforward — with actual 5G on the horizon, AT&T rebranding its 4G LTE Advanced network (which other carriers also offer) and changing the indicator on people’s phones to show 5GE (with the letter E de-emphasized) “violates federal and state laws governing false advertising and deceptive acts and practices.” It also undermines billions of dollars being pumped into infrastructure and network upgrades to be the first to mass deploy 5G across the country — something Sprint thinks it has a good shot at achieving. 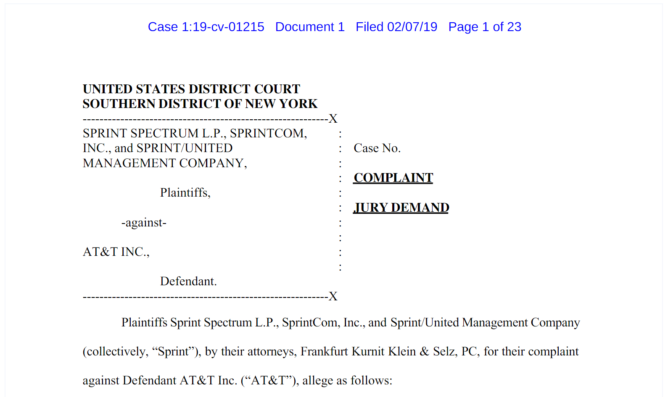 The lawsuit, which is worth a read, also mentions the results of a survey commissioned by Sprint — 54% of wireless consumers surveyed believed AT&T’s 5GE network to be “the same as or better than a 5G network”, with 43% believing that if they purchased an AT&T phone today, it would be running on a 5G network. Long story short, the misleading advertisements would succeed in, well, misleading people, giving AT&T an unfair advantage. AT&T has responded to the lawsuit, claiming that while competitors may not like the term 5GE, customers love it. The statement continues to affirm the rather obvious fact that AT&T will continue to work on deploying actual 5G while continuing to call its 4G LTE Advanced network as 5GE. It also sneaked in a burn about the Sprint – T-Mobile merger, “Sprint will have to reconcile its arguments to the FCC that it cannot deploy a widespread 5G network without T-Mobile while simultaneously claiming in this suit to be launching “legitimate 5G technology imminently.” It will be interesting to see in the days and weeks ahead if the lawsuit succeeds, but its a bad look for AT&T either way.